Just this week, I received a message from Viva Andrada of Fashion Art (F*ART). 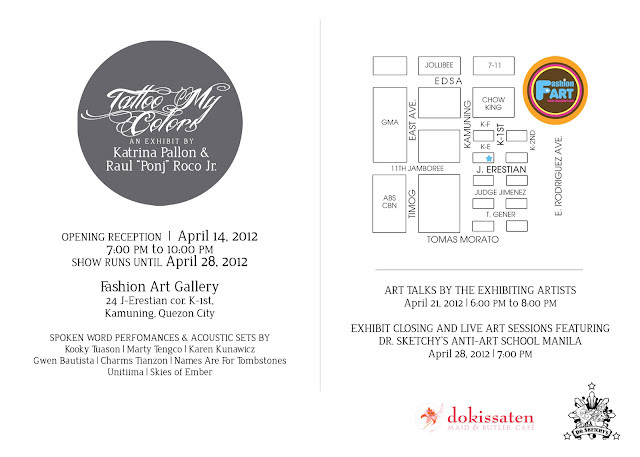 She invited me to an event in the F*ART g allery which is titled, Tattoo My Colors (hence the title of my post). Upon seeing the title I was like... Body art? Then I saw the poster... An art exhibit and the sample art works on the invitation are just a smashing beauty of colors. You see, I've been an art appreciator ever since. I consider myself artistic... In my own way, that is. Haha! But I'm more of a writer so... There! Tattoo My Colors is an exhibit by Katrina Pallon and Raul "Ponj" Roco Jr. Opening would be done on the 14th of April 2012 from 7:00 PM to 10:00 PM. 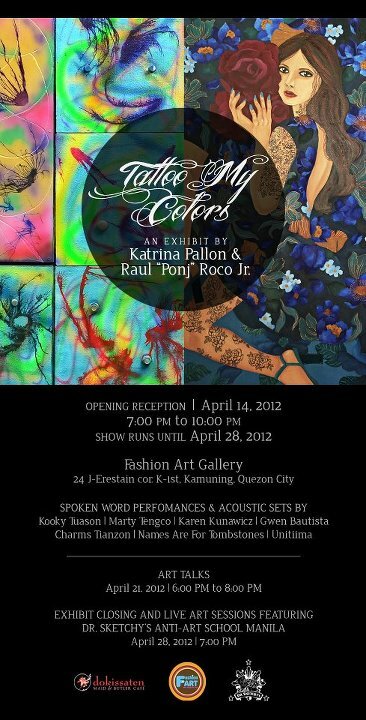 But for those who aren't available on the said dates, you may still get a glimpse of their art works until the 28th of April 2012 at Fashion Art Gallery (F*ART), 24 J-Erestain cor K-1st, Kamuning, Quezon City. Ayan ah complete address! The event will also feature the spoken word performances and acoustic sets by: Kooky Tuason, Marty Tengco, Karen Kunawicz, Gwen Bautista, Charm Tianzon, Names Are For Tombstones and Unitiima. And on the 28th of April, 2012 there will be art talks from 6-8PM. Wait, there's more! For on the last day of the exhibit (April 28, 2012), Thefre will be live art sessions featuring Dr. Sketchy's Anti Art School Manila at 7:00 PM. Exciting isn't it? Well, I'm not just after the artworks on this event, I so love and adore the F*ART boutique. Umm... Viva, would you still have the Flip Card booth there? Hehe. Now, more about the exhibit. The first collaboration of these two artists will give the audience a view from both ends of the spectrum. You see, Pallon focuses on details. Her penchant for grim, dreamlike scenarios serve as perfect backgrounds for her haughty, beguiling female characters - creating phantasmagorical pieces which are haunting as they are enchanting. While Roco's works are more vivid, surreal landscapes which are rife with abstract forms and shapes. His sceneries are explosion of colors, with arboreal outgrowths incorporated in each painting depicting the pervasive nature of life. Ooooookay, the descriptions were 90% copied from the actual invite. It's just that I cannot think of better words to describe how their art works are and what they do. First, I haven't seen any of their works that's why just by the description I'm just so itching to see their works and second I was captured by the beauty of the words used to describe the works of Pallon and Roco. hehe.